All this past year, both fashion and home decorating magazines have been focused on plaids: for clothing, shoes, handbags, upholstery, even tableware. At cross-point™ we introduced our tartans in 2007 in a broad range of colors and now, according to one of the prominent home decorating magazines, “…tartans are all the rage”. Confusion surrounds the origin and definition of tartans but it is generally agreed that they are of great antiquity, perhaps dating as far back as the 1st Century B.C. In more recent times, since the early 1800’s, many famous Scotish clans have become identified by specific traditional colors and patterns. 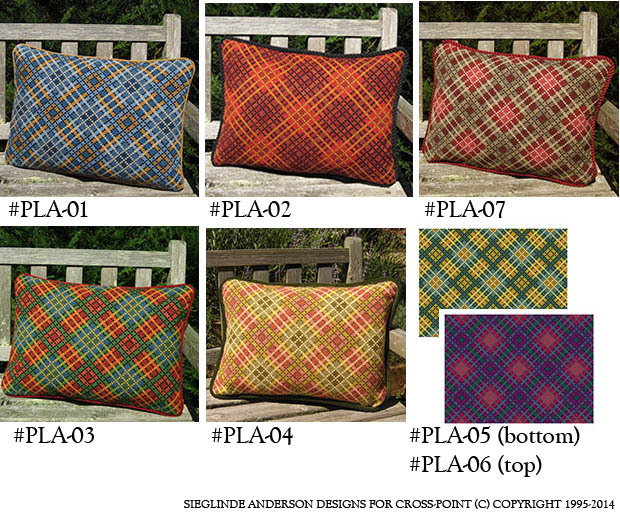 My Plaid design is an alternative and a liberal interpretation of this historic textile pattern, and, according to our sample stitchers, “a lot of fun to stitch”. I have stitched several of these myself and I agree – they are indeed fun to stitch. And, as with all cross-point™ kits, available in custom colors so you can create your personal touch! This entry was posted in cross-point Color Schemes, cross-point kits, Historic Textile Patterns, plaid patterns for cross stitch and tagged About cross-point, color schemes for stitching, credit card processing, cross stitch kits, cross-point, crosspoint kits, historic plaids for stitching, home decorating magazines, Interior Design, needlepoint kits, plaid cross stitch pattern, plaids, tartan cross stitch pattern, tartans, upholstery designs. Bookmark the permalink.